Attorney Alan Wax is the founder and first president of the Los Angeles Valley Applicants' Attorney Association (LAVAAA). Your future is too important. As recognized legal experts, we specialize in handling workers compensation claims! Whether you were injured at work or suffered an injury that left you permanently disabled, we are here to help you. At the Law Offices of Wax & Wax, we have a true passion for justice. As legal professionals who proudly represent the rights of injured workers and workers who have sustained disabling injuries, we genuinely hear the needs, concerns, and questions of our clients. We understand our clients come to our offices during a time of need – and we offer a supportive hand and an assertive voice. Let us be the advocates you deserve in your time of need. Our Glendale workers’ compensation attorneys proudly offer more than 100 years of combined legal experience and bring unsurpassed credentials, skills, and qualifications to our clients. Our founding partners, Attorneys Harold W. Wax and Alan J. Wax, are both recognized by their peers and colleagues for their professionalism and ethics. This is demonstrated by their AV® Preeminent™ Ratings by Martindale-Hubbell®, which is the highest possible recognition available in the legal industry. Don't Wait to Get Help if You Have Been Injured! Call Our Glendale work injury Attorney at (818) 946-0608 to Schedule a Free, No-Obligation Consultation Today! Our Clients Are Our Top Priority! What Makes the Law Offices of Wax & Wax the Right Choice for You? At the Law Offices of Wax & Wax, we have worked hard at generating a tradition of dependability, reliability, and consistency. Shortly after establishing his own firm, Attorney Harold W. Wax began changing the landscape of the legal field. Recognizing the need for an active and unified voice for California’s injured workers, Harold W. Wax was one of the founding partners of the California Applicant Attorneys Association (CAAA). The association was founded in 1966, and it became known as one of California’s most powerful and most knowledgeable legal voices for the rights of injured workers. Shortly thereafter, Harold served as the association’s first president in 1969. As a testimony to his commitment to upholding the highest possible standards of ethics and improving the overall advocacy of injured workers in California, he was awarded the Eugene Marias Lifetime Achievement Award. 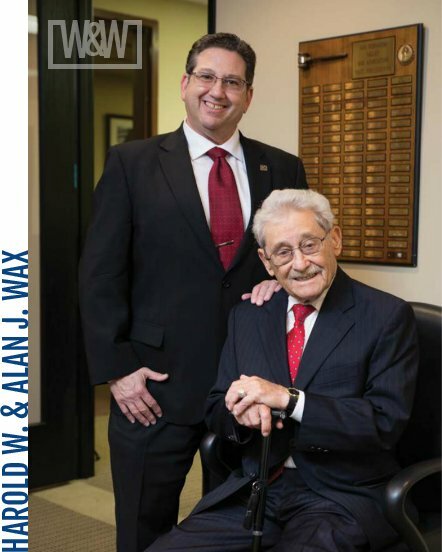 Following in his father’s footsteps, Attorney Alan J. Wax has also distinguished himself with his own exceptional work. He is the founder and first President of the Los Angeles Valley Applicant’s Attorney’s Association (LAVAAA), is the recipient of the Los Angeles Professional Excellence Award, and is an active member of the CAAA’s Board of Governors. About Us Meet the Team Why Hire Us? No one expects to be injured while on the job or while performing work-related tasks. If you have suffered an injury, illness, or medical condition due to work-related stress, you have rights. Most employees are covered by workers’ compensation, which is a type of insurance that grants financial compensation in the event of an injury or illness. Unfortunately, not all injured workers will be given their rightful amount of compensation, and in some instances, may even be denied their financial recovery. Working with a qualified legal professional who understands California’s workers’ compensation laws and understands your rights under these laws can only help improve your chances of obtaining a favorable outcome. In addition to handling workers' compensation claims, we can also help individuals file for Social Security Disability (SSD) and Social Security Disability Insurance (SSDI). Like workers’ compensation, SSDI is a type of insurance that is offered to eligible individuals who have suffered some type of disability and have been left unable to return to work as a result. SSDI cases are notoriously complex and difficult, making the importance of working with a qualified legal professional all the more important. Our lawyers have a comprehensive knowledge of the Social Security Disability Program and can explain your rights and options at this time. Our experienced Glendale work injury attorneys personally handle every case. Trust that you can put your future into our hands.